Please join us for a Long Table Lunch hosted by DBBR, Rustic Chix, and Priory Park Equestrian in the Swan Valley. Book your tickets now to take part in an unique experience in a rustic country setting while raising money for a great cause! Take a seat at the long table, and enjoy a 3 course lunch along with a complimentary glass of bubbles. The food is homemade, local, and rustic, and there will something for everyone to enjoy! Additional wine and beverages will be available to purchase on the day. Whether you come alone, with a friend, or in a group, you’ll be sure to have a day filled with fun and delicious food! There will be games, silent auctions, door prizes and raffles. Tickets are $60 per person, and all profits go to supporting Dogs Behind Bars Rescue’s veterinary costs and kennel bills. About Dogs Behind Bars Rescue (DBBR): Western Australia has an overpopulation of discarded and unwanted dogs. These dogs are left in the pound or boarding kennels for years without a home. Many dogs find this situation stressful and do not cope well with these environments, so Dogs Behind Bars Rescue strives to place them in a loving foster home with a family. While in foster care, we provide these dogs with the vet care they require, microchipping, and desexing. 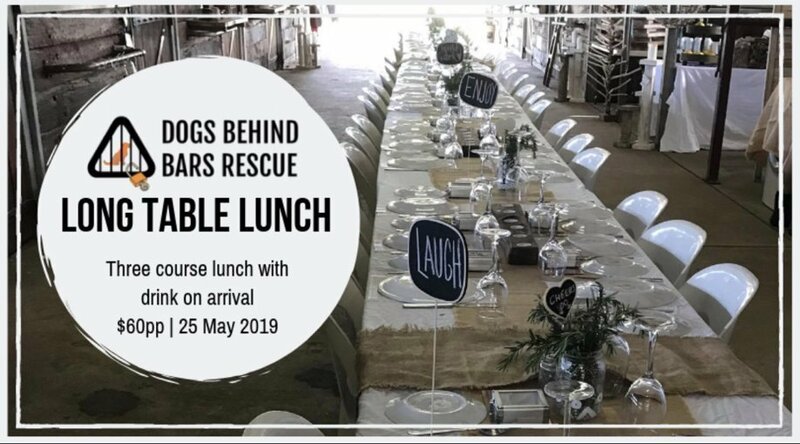 DBBR aims to remain a small, effective rescue organisation to provide the best care possible for these dogs while finding them the most suitable forever home. All funds raised from this event will go towards veterinary bills and kennel costs incurred while finding the perfect forever home for WA’s dogs in need!